Price history of Apple's iPhones: how did we get to €1600? Price history of Apple’s iPhones: how did we get to €1600? The top-specced version of the Apple iPhone XS Max (with 512GB storage) costs 1,650 or even more in some markets  some would argue youd be better off buying a car for that kind of money. 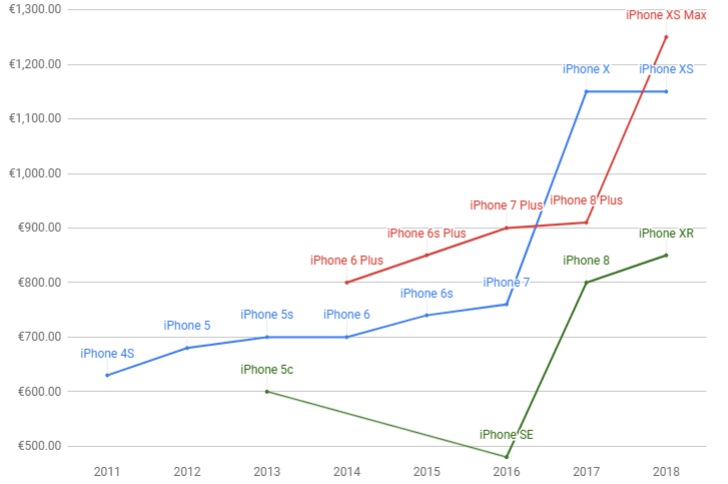 Apples phones have certainly gotten pricier over the years, a process that we though was gradual until we tried plotting the data on a chart. Looking at the results, the lines rise at a pretty steep angle. We start with the iPhone 4S in 2011 and heres why: the early iPhones heavily relied on carrier subsidies, so their true cost was hidden (and is difficult to calculate now). Instead, were using the SIM-free prices of iPhones at launch in Germany. The first chart focuses on the newly introduced models each year and how much they cost. We looked at phones with base storage for this one. Starting with the iPhone 5c Apple also added a “budget phone ” to its lineup, while the iPhone 6 generation saw the debut of the Plus lineup. Then in 2017 things get a little messy. The iPhone 8 was kept around as an affordable model, the true small/big iPhone duo was the iPhone X and iPhone 8 Plus. Indeed, the main 2018 models are successors to the X while the iPhone XR is taking over for the iPhone 8 as the cheapest option. Apple always kept some of the older models around at a lower cost, giving you the option to buy a new unit at a reasonable price (note: new as in not refurbished, not new as in latest model). As it turns out, the price of those has been pretty flat, especially in recent years where it hovers around the 500 mark. 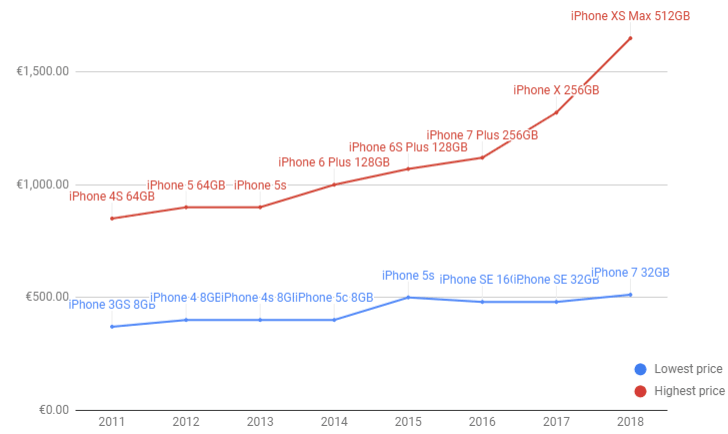 Theres opportunity to upgrade almost every year, only the iPhone SE stuck around as the cheapest option for two years (though in the second year it got double the storage). As long as you dont mind trailing the current tech by two years, its a solid plan. A plan you may want to adopt after you see how quickly the most expensive model climbs in price  the plus iPhone with the maximum amount of storage. It has gotten to the point where the price of the most expensive iPhone in 2018 (XS Max 512, 1,650) is three times the cost of the cheapest model available at the Apple Store (iPhone 7 32GB, 520). We dont mean to worry your wallets, but the rise in prices shows no signs of slowing down  2019 will likely be another step up. As for this year, iPhones sales are flat if you look at the number of units sold, but the revenues are higher thanks to the growing Average Selling Price. Long story short, Apple doesnt need to sell more phones as long as it can convince a certain number of people that the ever more expensive iPhones are worth the money.